I still find it hard to believe that there are people out there who believe Microsoft is going to bring Small Business Server (SBS) back. They seem to think that SBS was this massive revenue source for Microsoft when the reality is it was an ever diminishing product that was becoming harder and harder for Microsoft to engineer and support. That still doesn’t seem to console these people, who I believe are not only displaced from reality but are running scared of the changes happening in the IT space. Why? Well, when you dig a bit deeper into the demands they make, what they are really seeking is an on premise mail server. The major reason they cite is that their clients ‘only want email’. Although most pine for the return of SBS they deride Companyweb (i.e. SharePoint) and many other features that made SBS what it was. So it is all about an on premise mail server for most. You know what? I have come to believe the real reason is NOT that their customers ‘only want email’ it is because these resellers don’t have the skills to do anything but email! That’s right, now that SBS has left the scene, they are petrified that they might actually have to improve their skills and justify what they charge. They are scared that they might actually have to start learning something new. They are scared that they might not be up to that challenge. It is far easier to stay in a nice familiar world where technology doesn’t change than face the reality that change is what makes the technology industry such an interesting and profitable place to be. Most of these people I’ll bet moved into their own business with skills transferred from working for someone else. Problem is, now the technology world has changed and those original skills are in decline and it is time to learn new ones, but guess what? They can’t. I’d like someone to explain to me how you can add value to ‘basic email’ services? I can understand the added value implementing something like eDiscovery, Legal Hold, and so on that comes with something like Office 365 but how do you add value with supporting merely sending and receiving emails? The only way I can see you make revenue after setting these things up is maintaining them, but how can that compete with web based email services from people like Microsoft and Google? How can that even compete in the long run with free web based email services? If your game plan in technology is mere maintenance and you don’t have the scale then you are a small player in a race to the bottom when it comes to price. Please explain to me how this makes business sense? You are going to lose and yet these people still seem to believe that supporting ‘basic email’ services is a business? Really? The other problem with the statement ‘my clients only want email’ is that I don’t know one business I deal with ANYWHERE that only wants JUST email. They need a range of technology tools to solve business pain points. To me the statement ‘my clients only want email’ rings of resellers who aren’t proactive with their clients, who are simply selling technology rather than business solutions and who isn’t engaged with the clients to understand what opportunities there maybe in the future. And you know what? Sooner or later those clients have a change of management, grow or shrink in size, get taken over or merge with another business and things change. When that happens, they turn to their incumbent reseller for technology advice and then what? A reseller only skilled at ‘doing email’ just doesn’t cut it anymore so the customer chooses someone else in a blink of an eye. It is sad that so many technology resellers consider themselves so ‘advanced’ with technology because they waste their time installing some beta software when in fact they have become the main frame guys of the modern era, who simply want the status quo maintained because they are too scared or don’t have the skills to improve their qualifications with new products. They bemoan the reality of their business model becoming a commodity but fail to do anything to expand beyond services they have always provided. Resellers that say ‘my clients simply want email’ signals to me that it is not in fact their clients that want this, the fact is that the reseller probably does not have any skills beyond this. Worse still, they are also not prepared to grow beyond this limitation. That is why they spend so much time lashing out at Microsoft, hosted email services and other technology solutions. Far more would be achieved, in my opinion, if they took that energy and directed it to up skilling and facing the business reality that is the current technology market. In part 6 of my recent series on posts on social media in business I noted that Google Plus is one network that you can’t ignore. The above graphic (which I found on Google Plus) demonstrates the reach that Google Plus has achieved. If you believe this then it has a similar reach to Facebook, which is saying something. Clearly there is big difference between raw and active users when it comes to business benefits, yet the numbers alone indicate that, as I mentioned in my previous post, it is not a service you should be ignoring. So far this series has spoken about the different social media tools that are available, how they work and where they potentially integrate into a business. In the last part of the series I’ll look at the strategies that you should go about applying social media in your business and then round off with some conclusions. The first point to remember is that social media does not replace the need for a web site or any of your existing online marketing. It is designed to supplement and enhance these. Your web site is still typically the central place that you market your business. It tells prospects about how you can help them specifically. Think of it like a digital brochure. Before you dive head long into social media stop and ask yourself what you are trying to achieve? In short, determine your goals. 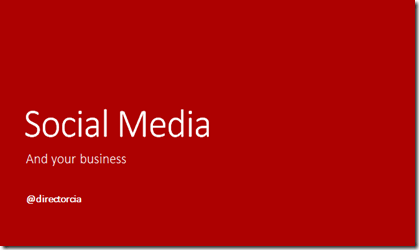 What do you want social media to achieve for your business? Do you want it to generate more sales? Better customer service? Or improved exposure for your business? If you don’t know what you are seeking to achieve how will you ever achieve it? Thus, the most important step in the process of utilizing social media for your business is to define you goals up front. The secret to successful social media (and with most other things in business) is consistency. Once you start using social media you must continue to use it on a regular basis. Nothing looks worse than something that hasn’t been used for months. I’m sure you’ve seen blogs and Twitter accounts that haven’t been updated for months and months. Nothing looks worse does it? This means you need to incorporate your social media strategy into your daily businesses processes. Determine how often you can post things to your blog, Twitter, Facebook, etc. and then ensure you do that. Consistency is the key to success. Just as importantly for business success is to measure the results of social media. Most of the platforms (especially YouTube) provide inbuilt metrics. If not then there are plenty of third party tools out there that you can use to measure the success and impact of what you are doing. As they say, if you can’t measure it then perhaps you should not be doing it. Track what works and what doesn’t, then adjust and improve what does. Remember, social media is not something that you can generally set and forget, you’ll need to adjust it over time. The final piece of advice that I’ll provide in this series before signing off comes from Seth Godin and I think it is very important that you heed what he says in this video about social media. I hope that you have received benefit from this series of blog posts on social media in business I have created. I’d encourage you to connect with me via all the services that I have mentioned here. Most of these you’ll find on my web site (www.ciaops.com) in the bottom left of the home page. Alternatively, you can always send me a good ‘ole email (director@ciaops.com) as well. There is so much more information, strategy and tactics I am able to share about social media in business and I hope to do that either upcoming blog posts, however if you’d like to speak with me directly about social media in your business or perhaps like me to present to a group of interested people, again just contact me. As always, thanks for taking the time to read what I write and I look forward to seeing your business out there in social media-verse generating success. On October 18 Microsoft will be unveiling a range of updates to their server line up, with a big focus on new capabilities that help customers take advantage of public and private cloud technologies. During this online event Mark will cover new capabilities of the Windows Server Essentials 2012 R2 product, as well as how some of these technologies are now more broadly available to larger enterprises as well. So come and join us for a what will no doubt be a great presentation by Mark along with technology news and discussions with other IT Professionals. I’ve now covered off important established social media services like Facebook, YouTube, Twitter and Linkedin but there is one more service which is now just starting to emerge that I believe you need to keep an eye and perhaps even have a dabble in. When you think about everything that I’ve spoken about in previous posts which major Internet service business haven’t I yet mentioned? In short, Google. Google has recently come to understand the importance of social and as such now has its own social network called Google Plus and I believe this is the real dark horse of the social media set currently. At the moment Google Plus is pretty much populated with technical types, it lacks the general appeal of something like Facebook and the business acceptance of Linkedin. However, that should be no reason to rule it out of your strategy. Google has very deep pockets and a wide ecosystem of products it can incorporate with Google Plus, and this is exactly what it is doing. Google Plus allows you to post updates and ‘circle’ friends like most other social networks but it includes things like the ability to create communities, events and and host Google hangouts (video meetings). Another very important aspect of Google Plus is that it looks great! If you haven’t already have a look at the Google Plus app for iOS and you will see what I mean. Making it ‘nice’ indicates to me that Google understands the audience it is targeting with this service. So what relevance is that to your business? Well to my mind if you spend your time with Google properties you will generally get rewarded with higher results in Google search. No hard evidence on this fact but it makes sense you think about it. This is one of the reasons that I moved my blog here to Blogger. (I am not special enough to get a +Name for my profile, alas). As with most other social media properties I recommend you sign up and have a look at what is on offer and see whether it may have business benefit. There is certainly nothing to be lost by using Google Plus and pushing your content through there. I have had many great conversations around blog posts inside Google Plus and for that it works really well. The side benefit I believe is better Google search ranking, but again that is just my belief. In the next part of the series I’ll start diving into some specific strategies and recommendations for your business when it comes to social media. If you need some help with your social media strategy or would like me to speak about social media at your business or association please don’t hesitate to contact me (director@ciaops.com). If you still REALLY wanted to do on premise SharePoint, beware that SharePoint 2013 Server and I assume by association SharePoint Foundation 2013 is currently NOT supported on the latest server release – Windows Server 2012 R2. You are going to have to wait until SharePoint 2013 Service Pack 1 is released. The availability date for this service pack has not yet been released. In the last post I spoke about how critical I believe YouTube is for business social media but now I’m going to really go out there with this idea according to most businesses I speak with. Here’s what blows most traditional business people’s mind – what if you allowed your normal electronic communications to be public? Yes, public. I have spoken before in this blog about how I believe information should be shared not siloed. This especially refers to all those private email conversations you have throughout the course of the day which contain information that could really benefit someone else. By having that information locked away in something like email limits the benefits it provides and decreases its business value. To me this is where a service like Twitter can reap business benefits. Let me start with my own examples. I have been using Twitter for some time now and as you maybe aware every post I make here on this blog also ends up being broadcast on Twitter. A while back I wrote a post about configuring Adobe PDF searching in SharePoint Foundation, after which I was contacted by VP at Adobe about the information I had posted (all good feedback). He had been monitoring Twitter for mention of his business. Where else would I have had an opportunity to directly contact a VP from Adobe? Not via email I can assure you. Another example, I have tweeted something to Mary Jo Foley and had a reply. Not about anything major but the point is that unlike email, using Twitter I am able to get direct access to an individual normally that I would never get via email. The big thing about Twitter is that it is public. I have had experiences where you complain about stuff in email and it never gets responded to. You call up customer support and get the run around, however if you do the same on Twitter, because it is public, you generally get a reply. Here, Westpac has a team of people responding to queries and complaints. They constantly monitor the Twitter-sphere for mention of their brand. In short, they are making their customer service far more public. That of course has risks but done correctly it can be a huge market advantage and again garner increased trust and transparency with your brand, which in turn generally corresponds to more business. The more pages about your business, from your business, to your business, etc all help your internet search results and driving traffic to your business. So now if you answer someone’s question on Twitter everyone can potentially see and engage with you. If you find interesting information and post it to Twitter people will start following you and listening to what you say. Likewise, you can find people on Twitter that post information that interests you and follow what they have to say. Again, the power of being public. A great example of this is that a few years ago a major hosted email provider had an outage. Their web site claimed their service would be back up in 15 minutes. They were in fact down for days. Firstly, I used Twitter search to monitor if anyone else was able to gain access (Twitter search is always great for finding out what is happening right NOW). This confirmed the fact that it wasn’t only me having the issue. As the delay on the services returning to normal continued I wrote a blog post about how I believe a smart business could use Twitter to find disgruntled customers of this ISP and then offer them a deal to switch. Low and behold, a day later that exact scenario can to fruition! Now all of my posts went to Twitter and mentioned the ISP in question so I don’t know whether someone read them and took up my idea or they came about through their own volition. In any case, that is great example of how you can user Twitter search to target an audience with a need and generate business. Although Twitter is generally limited to 140 character tools like Flipboard make Twitter such a rich and inviting experience. Using Flipboard your Twitter feeds create a magazine on the topics that are relevant to you. For many in business sharing more information publically is something they struggle to see the benefits of. I at least hope that this post has demonstrated some of the positive ways that a service like Twitter can be used to lift your business profile and start an engagement with people that you may be missing out on. It should also hopefully prompt you to start following other people of interest on Twitter as a means of discovering important and relevant information. to gain a better understanding of what information can be made available. Just before I get onto some general social media strategies I need to speak about the emerging dark horse of social media that I would suggest you need to pay attention to as it has the potential to be the most important social media platform of all. Any ideas? You’ll have to wait till the next part to find out. I must admit that I am a little puzzled by this product. Generally speaking I listen to audio from my phone via a headset. When I do occasionally listen to the phone speakers they are generally loud enough. This unit certainly does amplify the sound from the speakers but I am still puzzled as to why you would use one of these. I will also admit that most of audio listening I partake in is podcast or audio books rather than music so perhaps I am not the target market for this device. The device is certainly easy to use and works right out of the box as described. You simply turn it on, place the phone on top and it amplifies the sound from the speakers. Although the documentation with the device shows the phone lying flush with the device I found that I had to angle my Nokia Lumia off centre to get it to work best. If I didn’t do that then the volume was too low and you got a lot of background noise. Not a major issue but a little bit puzzling given all the other images I saw of a phone on the device. I think this device would have a good home on your desk where you could easily place your mobile on top to amplify audio. It looks very modern and would easy suit most environments. The device charges easily via a USB cable and has a conveniently located on off switch. What I would have liked to see perhaps is an actual volume adjustment on the device. Perhaps a volume wheel like you find on alarm clock as well as an on/off or mute button. This would be handy if you were listening to audio at your desk and you needed to silence it quickly to answer the phone. All in all, a stylish piece of kit that wouldn’t be out of place on any desk. It is easy to use and does what it claims, however a few more additions would have made it a little bit more convenient in my opinion.